Shaun White Snowboarding: World Stage was released on the Nintendo Wii on November 8, 2009. It was the sequel to Shaun White Snowboarding: Road Trip, that released on November 16, 2008. Shaun White Snowboarding: World Stage released with a MSRP of $49.99, but can now be found for around $20 new. It took 289 days for Shaun White Snowboarding: World Stage's play-time data to debut on the Wii's Nintendo Channel. Shaun White Snowboarding: World Stage has 7,771 players reporting play-time data, for its debut on the Nintendo Channel. Shaun White Snowboarding: World Stage has 50,909 Total Hours for its debut, and 6 Hours 33 Minutes play-time per person/console reporting data. The average play-time per session for Shaun White Snowboarding: World Stage is just about 1 Hour 16 minutes. Shaun White Snowboarding: World Stage's sale rank is #3,437 and is selling for $19.49 directly from Amazon.com. 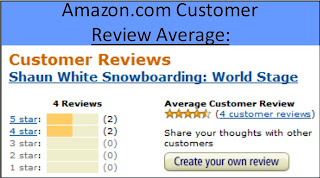 Shaun White Snowboarind: World Stage's review score average is 73.27%, based on 22 "professional" reviews on GameRankings.com. 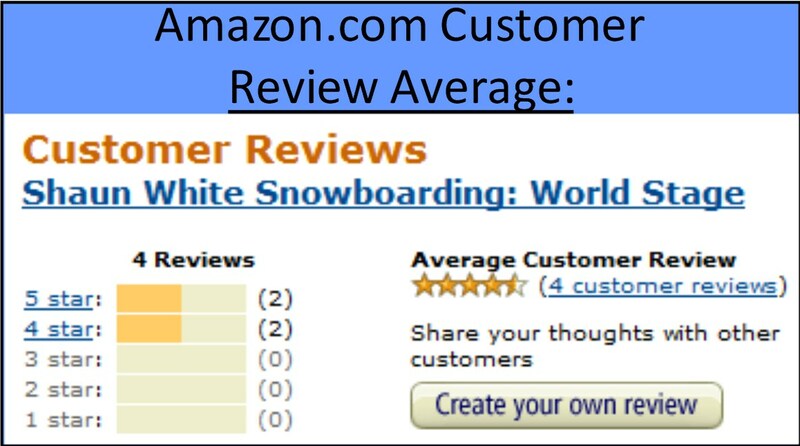 On Amazon.com, Shaun White Snowboarding: World Stage has a 4.5 out of 5 Star customer rating, based on just four customer reviews. Two were 5 Star, two were 4 Star. I have not played Shaun White Snowboarding: World Stage, but I do own the original Shaun White Snowboarding: Road Trip on my Wii. I also found it really surprising in getting the Amazon.com sale rank for Shaun White Snowboarding: World Stage, that Road Trip was ranked higher than World Stage. 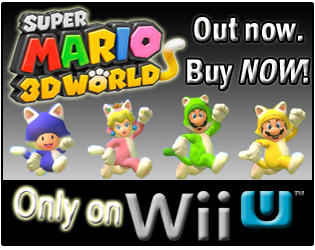 Both games have a MSRP of $19.99, so I find it surprising that the sequel, released in 2009, wasn't ranked significantly higher than the original, that was released in 2008. Also, I am surprised the sequel has taken so long to debut, because Shaun White Snowboarding: World Stage was released in November 2009 as a Wii exclusive, unlike the original which was a multi-console release. 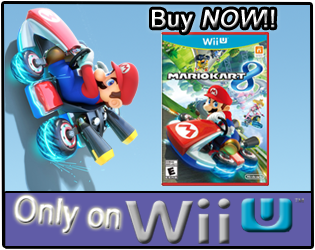 While Wii owners have not caused an avalanche of play-time hours with the game, at least from what has been reported; if Shaun White Snowboarding: World Stage is anything like the original, Road Trip, I would think the use of the Wii Balance board in the game is some of the best use of the Balance Board on the Wii. Have you played Shaun White Snowboarding: World Stage? If so, what do you think about it? Is it a game you would recommend to other Wii owners, especially considering both the original Shaun White Snowboarind Road Trip, and World Stage, are selling for around $20? Actually I finally found SSX Blur recently for the sub $20 I was looking for it for, so I've got my snowboarding fix for awhile. The Shawn White games look pretty fun actually, I just think I might prefer to mess with them with a Balance Board if I ever get around to getting one of those. I'm really surprised EA hasn't released another SSX title in a while. If you ever get a Balance Board, and you enjoy snowboarding games, I highly recommend Shaun White Snowboarding: Road Trip. I would say get Shaun White Snowboarding: World Stage, but I haven't played it; so I don't know if there are any glitches and if the game-play is the exact same as the first. I agree, the balance board controls are really great in the original, and that's why I was interested in the sequel and even the Skateboarding game...though I haven't played either of those yet. I do have a "draft" about the original, and the balance board controls, that I have had sitting around for a few months, perhaps one day(or year) I will finally finish that post! Thanks for the comment/feedback. I appreciate you taking the time to leave it! Oh! Also, I play with the balance board vertically at the TV, like riding on a snowboard...and I think the game can give your legs a great workout!